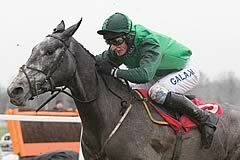 The grey Bristol De Mai dominated proceedings from flag-fall under Daryl Jacob and Nigel Twiston-Davies' six-year-old never saw another rival to complete a big-race double for owners Simon Munir and Isaac Souede, who also claimed the Christy 1965 Chase at Ascot with Top Notch. Cue Card failed gallantly in his bid to win the race for a fourth time as he finished second, a staggering 57 lengths behind the out-on-his-own winner, the 11-10 favourite. Jacob said: "He's a phenomenal horse, he's a beautiful horse. "He's a fabulous horse and we've always thought the world of him." Twiston-Davies said: "That was very good. I didn't have to worry about too much. I only had to worry about the last few fences and he jumped them well. "We've had a brief chat and the idea would be the King George, the Cotswold Chase and then the Gold Cup. "You might not get this ground (at Kempton), but we'll see. I'm not that worried about it. "He goes out and has his own way of doing it. He has a big engine and can go faster than that. "He's always worked fantastically well and he's a supreme horse. "He's very much an Imperial Commander type - he's a big, strong, gorgeous horse. "It was a bit of a rush to get the Gold Cup last year. He was ready, but I don't think he was at his best. "From what he does at home you wouldn't think he's improved from last season, but he obviously has. "He was beaten 20 lengths in the Gold Cup. It's a shame Sizing John isn't here so we could find out (how much he's improved)." Trainer Colin Tizzard accepted that Cue Card had been beaten by a horse on top of his game. He said: "I think he's run on par with his other runs. He's just been beaten by a very good horse on the day. The winner blew the race away, really. "He (Cue Card) jumped round and galloped on and finished second. "We'll go back home and see how he is."